Provider of transport logistics services and quarry products throughout North Queensland, IES Resources, recently purchased two C18 635 kVA Caterpillar generator sets from Energy Power Systems to power the crushers and ancillary workshop equipment within the crushing plant at the Castlereagh quarry, seven kilometres north of Cloncurry. As one of the largest quarries in the region, Castlereagh quarry supplies quality road construction materials to Queensland Main Roads and ballast to Queensland Rail in the region. It also supplies local customers with road base materials for the construction of mine haul roads and sand, and aggregates for concreting and stemmings. In 2008, IES Resources expanded the quarry’s production capacity with a new 200 tonne per hour sealing and concrete aggregates crushing plant that complimented the original 150 tph road base and ballast crusher. This prompted IES Resources to re-think the quarry’s power generation needs. “The Castlereagh quarry has a lifespan of over 150 years so it’s a massive resource and operates 12 hours a day, six days a week, producing over a million tonnes of quality products a year,” explained Kevin Flanagan, national fleet manager for IES Resources. IES Resources enjoyed a solid relationship with CAT Rental Power, a division of Energy Power Systems, the Caterpillar power systems dealer for Australia, and chose to seek CAT Rental Power’s advice. Kevin said that in the 18 months since delivery the C18 600kVA generator set had performed without issue in the hot, dusty conditions and had been more than adequate for the new crusher plant. With the original gen-set approaching expiration, the Castlereagh quarry gained capital expenditure approval to buy two new generator sets. Based on the performance of the C18 unit, Energy Power Systems Australia, Cummins and Detroit were invited to tender on the supply of two 635 kVA generator sets. “The decision to go with the 635 kVA units was mainly due to keeping an eye on the future, as the extra capacity would provide a healthy buffer for further expansion,” Flanagan explained. “We couldn’t have been happier with the performance of the rented CAT generator, but price was a critical issue for us, so our final decision was also based on value for money. “In the end, Energy Power Systems’ tender represented better value than their competitors. We ended up winning on both price and performance. The C18 Caterpillars were a perfect fit for our needs,” he added. Flanagan also commented that dealing with both CAT Rental Power and Energy Power Systems Australia was a seamless experience, with both companies providing professional advice. CAT Rental Power’s Steve O’Keefe worked with Castlereagh quarry’s manager, Ernest Woodfield, to select the best power solution. 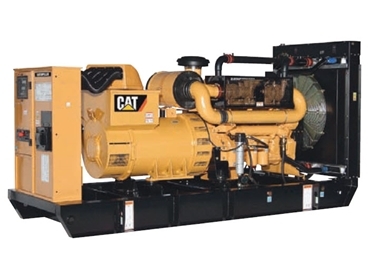 According to O'Keefe, CAT Rental Power’s fleet of Caterpillar generator sets meant that the most suitable solution could be selected and supplied quickly. “In the case of the Castlereagh quarry, the decision to rent before they bought new generators enabled them to run a 600 kVA gen-set along side a competitor’s gen-set. This enabled them to directly compare reliability, economy and support back-up,” said O'Keefe. With the ability to supply generator sets from 20 kVA through to multi-megawatt units, CAT Rental Power understands the business demands of today, no matter how large, complex or urgent. CAT Rental Power and Energy Power Systems are geared to provide full turnkey packages for prime power, stand-by power, peak shaving or special applications, even at short notice. Olympian Generators are a division of Energy Power Systems.